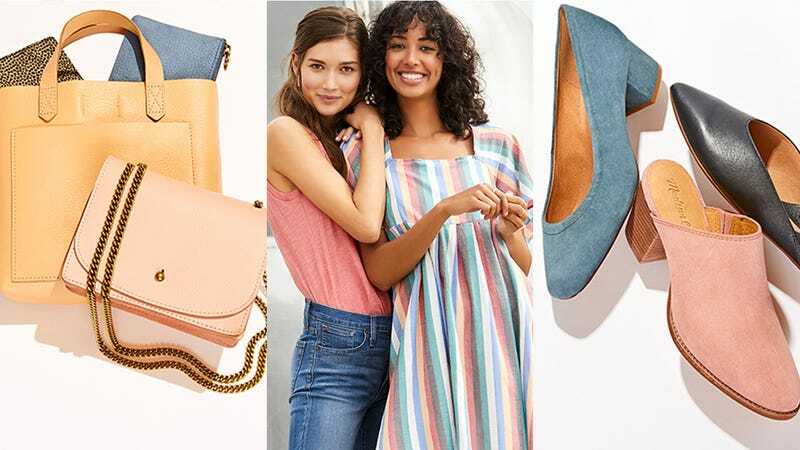 For the first time ever, Nordstrom Rack has debuted flash sales dedicated entirely to casual-cool brand Madewell’s clothes, handbags, and shoes. How do I know it’s the first time ever? Because I’ve been patiently checking Nordstrom Rack’s site every day, praying this moment would arrive. My wardrobe is so filled with Madewell apparel that I am essentially a walking Madewell advertisement when I get dressed every day (but this is not an ad, I just really, really love Madewell), so trust me when I say that now’s your chance to buy scores of quality, stylish stuff that’s more than half-off its usual price. A few of my favorite things on sale? A mockneck sweater I’ve been wearing all winter long, this lighter transitional spring sweater, this pleated scoop-neck top that I own in two colors (no shame), a crowd-favorite, zip-top tote in a smart cabernet color, plus a lot of great jeans and tees. Please, for the love of God, hurry over to this sale; the best items are already selling out.